I came across this quote about a month ago, and it's something I remind myself of very frequently. At first it seemed kind of obvious, I mean duh, but it suddenly kept popping up in my thoughts. 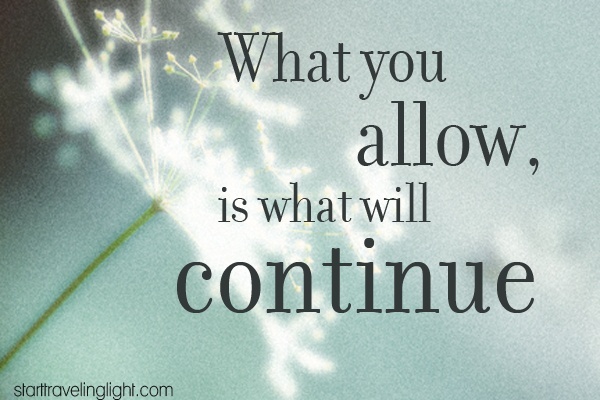 Whether it be the way you are treated by a friend, a spouse, family members, or how you view your health, what you allow will continue. Do you want to have a great body but can't get off the couch? If you're allowing yourself to not get up and go, you are allowing laziness to continue. Are you not getting what you need out of a relatinship? Unless you speak up, that behavior will continue. Feel used by a friend? If you brush it off and ignore it, it will continue. It's easy to blame outside influences for the choices we make, but ultimately if you are not happy with something, it's up to you to change it...or life will continue just the way it is. Very true! We have to start making sure that what we are allowing (especially as far as our own action and our own thought patterns) are things that ought to continue! I love this and it's so true! Love this! I recently mad changes to my life because of some of the scenarios you posted. Much happier now! I couldn't agree more, it's all about choice, our choices. We could whine and complain and woe is me, or we can get up and stop talking and start doing. love this and couldn't agree more. the reason I was lazy last night? My fault. the reason I will be lazy again? My fault....but I can't complain later that I didn't get anything done! I needed to hear this right now. Thank you so much for positing! Preach itttt. We're the only ones who can change our lives! Great motivation!! Great advice! It's like doing the same thing day after day and expecting different results - you have to be your own change! This is such good advice. I'm terrified of conflict, but by not doing anything it's definitely a decision to let things go on. Thanks for sharing! It's so true! It's easy to make mistakes, but they become habits when you keep doing them/letting it happen. Found you from the Blogtember link-up! This is great advice. Its so true and most people are passive instead of doing something to make themselves happy! I love your quote today and it is so true! Thanks for sharing. great quote!! I really needed to hear that to keep me motivated! It reminds me of that quote, "We accept the love we think we deserve". When we finally come to the realization that the ultimate power to change our lives lies solely in our hands, we become much happier individuals. You control your own destiny. We all need to be reminded of that at times. Excellent advice! This is so true. So true! It's just our own choice - let it or stop it! Love that quote! Couldn't have come at a better time!